The 100th Meridian is the 100th longitudinal line west of Greenwich, England which was set by Congress as a major goal in building the first transcontinental railroad. Construction of the Union Pacific reached the Meridian on October 5, 1866. The first passenger train brought 250 notables, including railroad and territorial officials, congressmen and newspapermen to celebrate the event here on October 26, 1866. A large wooden sign designating "The 100th Meridian, 247 miles west of Omaha," which stood close to the track for many years, was replaced in 1933 by the Cozad Chapter of D. A. R. In 1879 Major John Wesley Powell in his report for the United States Geological Survey recognized the 100th Meridian as the natural demarcation line between the humid east and the arid west. Evaporation from the gulf waters supplies most of the rainfall for the eastern half of the United States. West of this line precipitation, which comes largely from the Pacific, is insufficient for agricultural needs without irrigation. Here on the 100th Meridian the humid East meets the arid West. 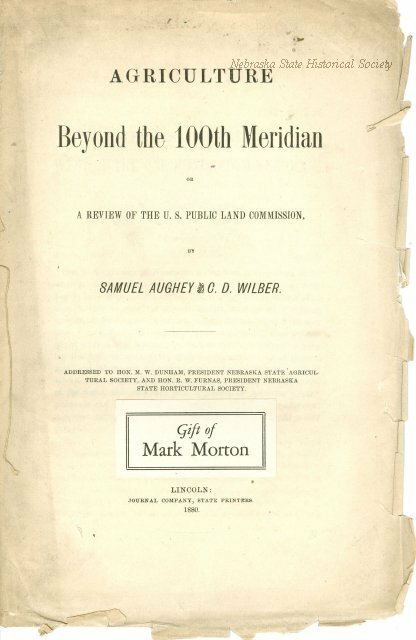 “The 100th Meridian,” Explore Nebraska History, accessed April 18, 2019, https://mynehistory.com/items/show/140.